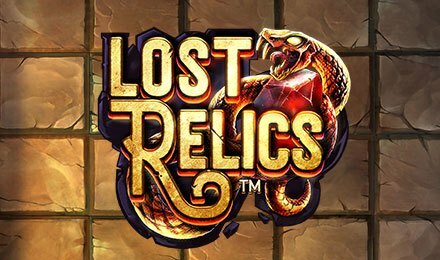 Lost Relics slot is a 5 reels and Cluster Pays game that is now featured at Wicked Jackpots Casino! Enjoy this adventure, that takes you on a journey to visit ancient ruins to discover lost treasures. As you spin the reels of the marvellously built slot grid, come across symbols like Hearts, Diamonds, Clubs, Spades, Helmets, Daggers, Bracelets and Snakes Wrapped Around Rubies. Six or more symbols appearing in a cluster awards a win. Any symbol is part of a cluster if it is horizontally or vertically adjacent to the same symbol. Set your stakes on the Coin Value Field. Use the Autoplay option to play the game hands free! Set from 10 to 1,000 auto spins to play per game. Amount of Paylines Selection: Form clusters with 6 or more symbols to trigger a win. The game does not have paylines. Coin Values: Coin values range from the minimum of £0.01 to the maximum of £2.00. Wild come into play later in the game, on random features triggered on Lost Relics slot. The scatter of the game triggers the bonus round of the game. Sticky Wilds: Wild symbols are added to the reels and lock into place for the duration of the feature. Coin Win: A coin win of multipliers of 3x to 30x are awarded. Coin Wins: Awards a coin win of 3x to 30x which is applied to your stake.